« Will the state services commission up hold the code of conduct ? Thank you for your letter dated 29 November ,It has become apparent to me that Mr Wells who was accountable to MAF has been calling the shots all along and hence the need for secrecy. I would have thought that an organisation accountable to MAF would be directed by MAF and not vice versa. My OIA requests have been with regards to AWINZ and how AWINZ received approved status, the fact that you constantly communicate with Mr Wells seeking his approval leaves me wondering if in fact the tail is wagging the dog. Why that MAF is communicates with Mr Wells with regards to OIA requests made to MAF? And why the privacy commissioner has had to be involved. AWINZ has no legal existence it therefore is not a person natural or other wise and is not subject to the privacy act. Please provide me pursuant to the OIA , with any policy , agreement or legislation which require you to advise Mr Wells when I make inquiries with regards AWINZ. This is about transparency but you appear to defend your right to secrecy yet the documents you sent me contained the following picture . It indicates to me that MAF does not understand what transparency is about and the right of the public to access information. The information I have sought is with regards to a public private relationship one where the person who made the application had significant input into writing the legislation which facilitated his own business plan. The application was then made in circumstances where like our peacocks the cards were not on the table and Mr Wells was making statements which were not true and not verified by MAF in any way. If things are being done honestly and with integrity then there is nothing to hide, but because of the manner this application preceded there has to be secrecy as by exposing the cards the truth will be revealed. What is occurring now is that I am exposing the cards and MAF is simply denying that they are there, this is another concealment tactic frequently practiced. 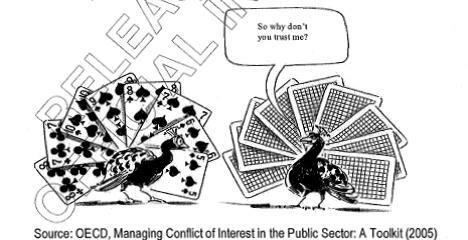 By example:- referring to the picture above I say look at the peacocks and MAF says no they are ducks you are nothing but a troublesome person go away and allow us to be in denial so that those of our staff who have had close involvement and have been negligent can retire with dignity. You also provided me with documents on conflict of interest, and it would appear that you totally ignore the fact that someone who is not employed by MAF but is accountable to the minister through MAF could actually be in a situation of conflict of interest and if you were to apply the principals contained in that document you would see that he was in a situation of conflict of interest. Yet MAF facilitated this conflict of interest your officers being referees for Mr Wells in his application for the position which placed him in conflict of interest. Your audit report showed that there was nepotism, lack of governance, lack of accountability conflict of interest yet Mr Wells was able to write a letter much like the one he had written years earlier( 18 aug 2000 ) so that MAF jumped to attention and compiled with his demands. Mr Wells is apparently so powerful that he managed to meet with ministers and persuade them to change the LAW , ( see letter he wrote to Sutton, this letter saw the law changed. ) what is incredible about this is that the council was not involved and AWINZ was a pseudonym for Mr Wells and had no proven existence or track record. I realise that this whole thing is an embarrassment to MAF and its almost part of NZ culture to stand staunch and continue to deny the obvious , after all it is better for my integrity to be in question than that of MAF- Public confidence has to be considered after all. That is why I am publishing everything. ( www.transparency.net.nz) Transparency is what we are assured and you have shown that MAF does not want a bar of it. MAF needs to act according to the law not just pretend. Corruption is real and to rely on a perception that there is no corruption by hiding and denying it does not serve the country as this will allow corruption to flourish. Where has the transparency been in the public private relationship of MAF with AWINZ? Mr Wells had good reason for secrecy because his operation in the false name of AWINZ relied on it. He was running an operation using premises, staff, vehicles and infrastructure which were owned by the public to derive an income for himself through his pseudonym AWINZ. He sought law change to accommodate it.. I am a Whistle-blower, I did not mean to be one , had MAF done its job properly I would never have asked the question “ why does AWINZ not exist’ Instead I would have found it on some register and/or your documents would have defined AWINZ as being a particular legal entity or groups of entities/Legal persons . Instead AWINZ was undefined and had no legal existence and because of that I walked into a trap. Mr Wells has been able to assassinate my character and having done so with his lies and perjury no one has looked further than the perception he has created. No one has taken time to look at the real evidence, that is the proof that AWINZ the “organisation “ which applied for and obtained approved status .was a fiction. This issue has nothing to do with my character or perceived character it has everything to do with an organisation which had no real existence apart from being Mr Wells acting as if he was an “organisation” – the clue would have been that he was the only visible person the only one who signed anything and the person covering up. He had to cover up it as after all the perfect fraud one that could have made him significant sums of money had it not been for my questions. It has long been known that attack is the best form of defence and attacking me has been what has protected AWINZ from a proper investigation . This has gone on for 6 years, I have played this game of official information act requests for far too long, It has cost me personally and my business, I want this to end and have my reputation restored and I want accountability of MAF for the corruption that they have ,apparently , condoned. Mr Wells’s long term relationship with MAF and the personal interaction of many high ranking MAF officials appear to have served him well. But as I have said before , this is not about me it is about AWINZ so the following official information act request therefore focuses on process rules and legislation applicable to AWINZ. You advise that there is no information with regards to anti-corruption policies in investigations and audits and I therefore have to question if corruption issues and fraud were ever considered, I hope that with the production of the following documents someone may just say hang on something is not right here. I will indicate in each what I have already got and if there are further documents which put a different view on what I have , I would like to have them supplied. please provide all documents which show that your investigations and Audits considered fraud and corruption issues with regards to AWINZ , the application for approved status and the manner in which AWINZ operated. Please provide any documentation which over rides the intent of this document (as stated on page 1 ) and any correspondence which provides for exception to this document for any application. On page 2 it states “although the term “organisation” is not defined in the Bill, an individual cannot be approved as an organisation” Given that no other persons were involved in the application (document 3) and no trust with the name animal welfare institute of New Zealand existed at the time of the application 22 November 1999 (see trust deed dated 2.3.2000 document 5) Please provide documents or evidence of any the exemption which allowed Mr Wells to make an application for approved status in a pseudonym or for and behalf of any other persons without their knowledge or consent. i. If it is not accepted by MAF that the application was made in a pseudonym please provide evidence of all entities/real persons which applied including evidence of their existence on the date of application. ii. If MAF believes that the application was made by a trust could they please provide documents which consider how people who have not met together or have formed a common purpose together can have an application made on their behalf and without their knowledge? iii. I wish to refer MAF to document 1 attached. In this document Mr Wells states as he later also did in the application “A charitable trust has been formed by Deed of Trust as the “Animal Welfare Institute of New Zealand” (AWINZ). It is being registered under Part II of the Charitable Trusts Act 1957”. This document is dated 20 August 1999. It is obvious from the evidence and from later admissions in court By Mr Wells that a trust did not exist at this time . Please provide MAFS policies with regards to people making false statements and what would be the expected action of MAF . The question has to be is it Ok to tell lies to MAF and the minister is this condoned. It would be good for the public in New Zealand and the tourists who arrive here to know how MAF views lies and if all lies are treated the same. If telling lies is not condoned why is this false statement ( lie ) being condoned. ( and the rest of the document which is an notice of intent from a trust which did not exist. iv. Please also provide copies of all correspondence relation to the supply of the trust deed in 2006. We have already covered in our previous correspondence that no applications, approval or correspondence was received from the persons Mr Wells alleged to have been “trustees” of AWINZ namely Graeme Coutts, Nuala Grove and Sarah Giltrap. 4. Were aware of the responsibility they were taking on. accountable to the approved status . ii. Please provide a copy of appendix 1 referred to as I have not received a copy of this. On page 5 under the heading REQUIRED INFORMATI0N please provided all documents correspondence which verified these details and show how they were accepted as being true. i. (a) Full name of applicant: Please provide any correspondence, notes discussion papers which consider who or what the applicant Animal welfare institute of New Zealand is . To be fair we know now this was a pseudonym , no organisation existed by that name an no other person made the application or consented to it. Please accept or deny the fact that this was a pseudonym, if you deny it was a pseudonym please provide evidence to support your reply. ii. The application states that AWINZ has been formed by way of trust deed and is in the process of being incorporated under the charitable trust act. Please provide all documents which show when and how MAF became aware that this statement was false and provide documents to show how this was mitigated (other than by cover up) . I believe that you will find that this came to your attention in 2006 when I raised questions about the existence of AWINZ , it was subsequent to this that you received a trust deed as you had advised me that prior to this you have never had a copy of the deed. iii. Provide all documentation discussion papers which considered the implications of the statement with regards to formation of a trust and incorporation , being false and the consideration of trading with an unincorporated trust. v. (c) the area in which the applicant proposes to operate, this was stated as nationally , Considering the fact that the staff involved were those of Waitakere city council Please provide all documents which considered the ability of the applicant Mr Wells to operate nationally . vi. (d) Sets out the information that will enable the Minister to assess whether the organisation meets the criteria . It would appear that with the lack of existence of an organisation named AWINZ and the lack of provision of a trust deed that this criterion was not met. Please provide documentation which outlines any process or any law which permitted MAF to allow this matter to go before the minister without advising him that the criteria had not been met. vii. The approval of AWINZ came through cabinet after Mr Wells had involved the labour party via their president Bob Harvey ; the application went to cabinet against treasury advice and when the document went to cabinet, somehow the words INC had been introduced, portraying AWINZ as an incorporated society . Please provide any documentation which shows how and when the words INC were introduced and why the minister was led to believe that AWINZ had been verified as an incorporated society when it had no such existence . Please also provide documents which show that MAF recommended the application for consideration by the minister. Please also provide documents which show that MAF recommended the application for consideration by the minister and had confirmed that the criteria had been met. i. As an aside it should be noted that Tom Didovich who called himself a trustee was also the person who wrote to the minister for and on behalf of two councils didovich to maf north shore and didovich to maf waitakere . Please provide details ( notes, interview jottings ) of any enquiries which MAF has undertaken with the alleged trustees of AWINZ namely Graeme Coutts, Nuala Grove and Sarah Giltrap. Documentary Evidence other than an assumption, that the trust AWINZ was one and the same as the approved organisation AWINZ. The minister was to rely on information that MAF provided “to assess whether the organisation meets the criteria set out in section 121” Your document states “ It must be possible to verify the legal status of the organisation, including a clear statement that its principal purpose is to promote the welfare of animals.” Please provide documentation to support as to how in the absence of a trust deed , the Legal status was verified. Mr Wells wrote documents alleging a quality management system, however your audit in 2008 raised questions of governance , please provide all documents which showed that consideration had been given to the criteria which required AWINZ to have management , associated policies and procedures and documents or notes which show that the existence of these were verified. With regards to the provision for a Copy of the employment contract or other written agreement or arrangement between the organisation and inspectors and auxiliary officers, Please provide documentation which considers the ability of a council manager (didovich to maf north shore and didovich to maf waitakere ) to be able to authorise the contracting out for no remuneration the staff paid by the council he is employed by and also provide documentation which explains why MAF sought approval from a council manager rather than dealing with the council itself. Please advise what consideration MAF gave to the conflict of interest when Tom Didovich who had authorised the use of the council facilities and resources including staff allegedly became a trustee of a trust with the same name as the approved organisation . “All information should be clearly written, be comprehensive and credible.” It would appear that 2 out of three is all MAF went for why was credibility not an issue and please provide all documents which prove that there was independent verifications to show that the information was credible and did not rely on long standing relationships of trust. On page 6 The evidence must show that “‘the principal purpose of the organisation is to promote the welfare of animals”. What documentation is there that show that consideration was given to AWINZ history , Please provide the documentation provided with regards to AWINZ history , given that it did not even exist at the time of making the application as proved by the trust deed belatedly supplied in 2006 . Page 7 “The accountability arrangements, financial arrangements and management of an organisation must be such that having regard to the interests of the public, the organisation is suitable to be declared an Approved Organisation.” Please provide all documentation which considered the interest of the public in giving approved status to AWINZ. e.g. how were people going to be able to identify who or what AWINZ was? Who comprised it and how to locate it? Management of the organisation: why as there not a management structure and why was Neil Wells allowed to be the only person speaking on behalf of others who had no proven involvement ? Please provide any documents which consider this. Page 9 Conflict of interest .Please provide all documentation which considers the conflict of interest of Mr Wells in making the application using a pseudonym and being the only person involved in the running of AWINZ in conjunction with his council work and using the councils premises, resources and staff. The evidence we now have is that Mr Wells was the only person who ran the bank account he had opened in the name of AWINZ into which he banked the proceeds of prosecutions returned to him by virtue of section 171. Inspectors properly answerable Please provide any documents which consider how an inspector can be properly answerable to an organisation which has no existence or definition and which did not identify its members and/or where the alleged members did not know they were an approved organisation. Please provide evidence of the legal composition of AWINZ ( who it as comprised of and when they resigned ) from the time of the application to the time it was Gazetted as being removed as an approved organisation. Pease rely on the best evidence , that is documents signed by those persons and not just documents forwarded by Mr Wells. I am certain that MAF will struggle with many of these questions and it will become clear that AWINZ would never have attained approved status if the simple policy you had had ben adhered to and the act had been adhered to . The reality is that there was significant political intervention combined with MAF turning a blind eye to mater which would normally be considered serious. I Hope that MAF sees that transparency is about doing the right thing and about owning up and saying we stuffed up when things have gone wrong. I have been made the sacrificial lamb on this matter , It is time MAF acknowledged the fact that they got it very wrong. What can be worse than giving law enforcement authority to a non-existent organisation.. It is allowing one man to write legislation for his own use and then tell lies to conceal the truth. The RNZSPCA and a groundbreaking decision from the Canadian courts .. will it impact on us ? Fake NZ doctor why was the whistleblower ignored !!!!!! Open letter to Vivienne Holm solicitor for FMA. Mycoplasma Bovis a blessing for the greenies and waterways or simply too convenient? disclosure whose truth do you buy?